I hope you enjoyed using the Animated Cursor Generator, and if you did, be sure to like, subscribe, and stay tuned to This and That, Here and There. If you enjoy my tutorials, you will also enjoy 24work.blogspot.com which has many more Blogger Tricks and which I got this generator from. 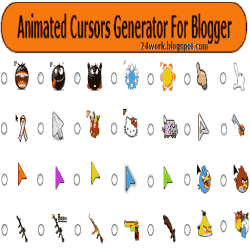 If you would like to add this generator to your blog, simply copy-paste it onto a new post. I will see you soon! Bye!